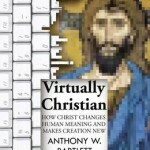 Join Ray as he talks with Anthony Bartlett about his book Virtually Christian. The good news is even better than we thought! Tony helps us understand that Jesus is about the business of actually changing what it means to be human in the here and now. More than preparing us for a transfer to a heavenly existence somewhere in the realm of the metaphysical, Tony believes that God has committed Himself to the earth in the person of Jesus. Exciting stuff! Join the conversation and check out Tony’s book Virtually Christian. Thanks Tony for inspiring us with the love of Jesus! You should check this out: an interview with Tony Bartlett, author of VIRTUALLY CHRISTIAN and CROSS PURPOSES. (Also the guy who married Dana and me!) Bryan McLaren is mentioned in this interview from last August. I thought of Tony because of the “postmodern” thing. Anyway, Tony is just great.